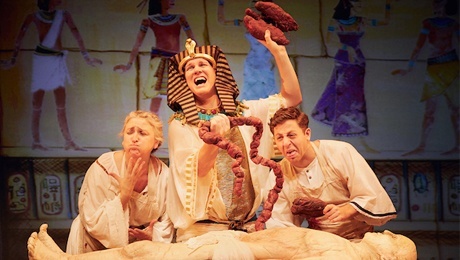 The Horrible Histories franchise has rolled off our small screen and arrived at Hanley’s Regent Theatre. And thank goodness it has because it provides rollicking good fun for all. The series of history books have been written by Terry Deary and illustrated by Martin Brown since 1993 and have been a cult part of children’s TV for the past ten years. The series was created with the intention of teaching history in a comedic way and on the evidence of this performance the aim has been well and truly achieved. The audience was treated to a whistle-stop run through the history of the pharaohs in general but with great emphasis on how bodies were prepared for the afterlife and why they were mummified. The audience was both educated and entertained through a series of jokes, music and special effects and the whole was delivered at a cracking pace. And despite the scene being set many thousands of years ago, there was still a place for Donald Trump, the Kardashians, flossing and Brexit to appear. This production was adapted by John-Paul Cherrington and appears courtesy of the Birmingham Stage Company. The Company has extensive experience of working with creations from the likes of Roald Dahl and on the evidence of the press night this shines through the whole experience. The production is pitched at just the right level to entertain the target audience of young people but to make it an extremely enjoyable experience for the more mature members in attendance. Awful Egyptians begins with Miss Hap (Lisa Allen) and Milo (Izaak Cainer) as members of a school party who become locked in a museum. They soon meet Ramesses (Simon Nock) who takes them back to Ancient Egypt to meet some of his ancestors. The first half of the show sees the three actors take on a range of different roles requiring swift costume changes and culminates in a very enjoyable audience participation exercise that would grace any pantomime. The second half of Awful Egyptians moves to another level as special glasses are donned and the audience is treated to a series of spectacular 3D effects. The Creative team is to be congratulated on these special effects and the ever-changing backdrops that allowed us to see the creation of the pyramids and experience the sensation of being in a tomb. I would not be surprised if the screams of delight and fright were not heard from some distance away. The cast do an excellent job in keeping the pace going in a larger-than-life manner (and that is meant as a real compliment as the whole experience is like being present at an academic pantomime!!) Simon plays his roles as well as any pantomime villain and is a commanding presence on stage; Izaak’s very likeable character shines through and he shows a great rapport with the audience; and Lisa provides excellent back-up to the other two members. All three give the appearance of enjoying working together and have good singing voices. If there were to be any slight criticism it would be that in my opinion the knockabout fun could start sooner in the production to really grab the youngsters from the start and many of the lyrics of the grave robbers’ song were lost. However, it would be churlish to dwell on these minor negatives. This is a really entertaining show and I defy any member of the audience to leave without learning at least one fact about Ancient Egypt. Get along if you can. The production lasts for 1h 45 minutes including interval. Awful Egyptians alternates with Terrible Tudors. The productions run until March 23rd.